Dutch Gold Loose Leaf (Imitation Gold) - 5-1/2 x 5-1/2 inch Leaves - This Gold Leaf is actually not gold at all. It is made from Brass and has several names such as Imitation Gold, Composition Leaf as well as Brass Leaf. It is considerable less expensive because there is no gold to be found in it. We carry the #2 Composition Gold which looks similar to 23 Karat Gold. Compostion is 88% Copper and 12% Zinc. Although it looks similar one should be aware that it tarnishes very quickly and must be polished and sealed with a varnish as quickly as possible. The leaves are larger 5-1/2" x 5-1/2" and are sold 25 leaves per book. 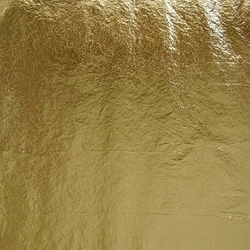 This gold is only available in loose leaves and should be applied with a Badger Gilder's Tip. This metal leaf is simply too heavy for the Kazan Gilder's Tip.